I think we all know that emotion today. Grazie, Ragazzi! So many concerns going into the match about players with last minute injuries. We feared for the worst. But, as Allegri in his typical charismatic style pointed out, the match would start 0-0. What happened after the whistle blew was beyond some of our wildest dreams. Except, I suspect Allegri and the boys. I would love to know what he told them, what he fed them going into this match to make such a difference, because it was all perfect. He got the lineups perfect (although of course we still doubted!) he got the tactics and motivations perfect, and the boys executed everything as perfectly as possible. Which is good, because we have another 90 minutes to play away before this duel is done, and we will have to pull this off again there, too. Milan kept it tight early on, but showed that they were not going to be worrying about their usual 60% average possession. In fact, we only had 27% possession on the night. But with insane focus and clever counters, we got 8 shots off, 3 of those on goal. Compare that to Barcelona’s 7 shots, with only one of those on goal, and you can see how our efforts paid off. We did not “park the bus,” but we defended with a tenacity and focus I have not seen all season, or as my commentators said, “hunted in packs.” Maybe it was sheer experience, having faced them so many times. Or because Chelsea admitted to using Milan’s tactics last year to send Barcelona out of the Champions League, but Milan were prepared, and it showed from kickoff all the way through the end of the match. In the first 10 minutes, both Mexes and Zapata had each made an important clearance. El Shaarawy looked dangerous every time he got the ball, and in the 21st showed yet again why I call him our “best defender.” Things were already getting rough, and they just got rougher the more we frustrated this team who are known for their version of “total football.” Mexes, of course would draw the first yellow in the 25th, from tackling none other than the 4 time Ballon d’or winner himself. In the 36th, though, El Shaarawy looked perhaps the most dangerous of the game to this point when Boateng threaded in a nice ball. But the half would end scoreless, frustration on both sides. However, credit to Milan for coming back out calm, even more focused, and for the first time in a while, stringing together two great halves together in one game. Barca seemed a little renewed, too, and stepped up on possession, but Milan continued to make the most of their chances. The ref allowed a decent amount of contact with no calls, like some of the Barcelona players who met Boateng, for example. But in the 54th, Busquets had a nasty tackle on Pazzini that saw him get hurt probably worse than Pazzini. Yet it was his ego that was truly damaged when the ref awarded him a yellow for his performance. That’s certainly not the direction his acting coach and motivation were looking for. Alves then proceeded to take down El Shaarawy but not get a card, this ref trying to keep everyone guessing. But in the 56th, he kept Barca guessing again when Boateng scored a goal that appeared to have deflected off of Zapata’s arm. Milan 1-0, and Barcelona no call. Piqué was so upset about it, he earned himself a yellow protesting the non-call. Now Barcelona were angry and frustrated. So Sanchez came on for Fabregas, and Messi took a rare free kick that went wide. In the 66th, Pazzini and Puyol clashed heads as Pazzini cleared a ball. Both had to have treatment, I really hope there are not lingering issues with this one, it was not pretty. Barcelona seemed unsportsmanlike after this to not give the ball back to Milan, which the crowd let them know in no uncertain terms. But on the pitch, Milan just got the ball back of their own accord, and Pazzini had probably his best attempt of the night with a nice bicycle kick that unfortunately went straight to Valdes. Then Abate also bumped heads, he was already wearing a gash on one cheek he acquired early on in the match. Finally, in the 75th, with Pazzini still looking a little dazed, Allegri brought on Niang for the Italian. Barca were getting a couple of opportunities from distance now, but the poised 18 year old would send it in to El Shaarawy, who crossed it calmly over to Muntari, who just buried it past Valdes. 2-0 Milan. Yes, you read that right, 2 goals for Milan, 0 for Barcelona. El Shaarawy, who looked like he was in a bit of pain after all of this, was subbed off for Traoré in the 87th. Traoré made his impact on the match by earning a yellow in the 91st, then following it up with a nice dribble into the area where he lost the ball, not having seen a wide open Niang ready to go in for the kill. But it was okay, Balotelli and Robinho were already jumping around in celebration up in the stands. 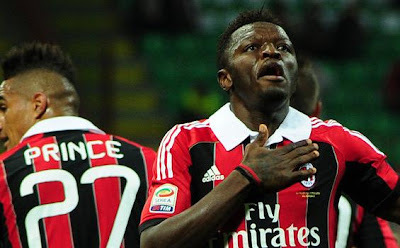 That's Sulley Muntari, if you didn't catch the name, world. He just scored on Barca. Barca were stunned, it is not their first loss this calendar year, but will likely prove to be the most painful. Milan fans were stunned, too, but in a more vociferous and celebratory way. As fans, we all believe in our team at least a little, even when all of the odds are against us. As I said in my preview post, “We are AC Milan, and we come to play.” My hat is off to Allegri for wisely ignoring the tactical advice of Berlusconi on this one, and for digging deep to prepare the team properly mentally and physically. The 12th man was probably my man of the match, the fans were epic on this night. I hope that many of them are able to travel to Barcelona in a few weeks. 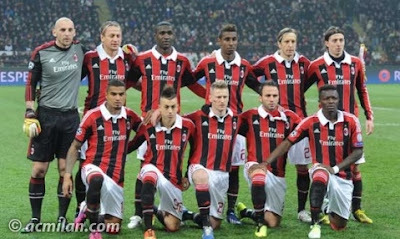 But I truly I cannot say enough about every player that stepped on to the pitch for Milan. Think Ambrosini is old, tired or washed up? Watch how he chased that ball down several times like a 20 year-old, and the tackles and passes he made that kept this game going. Every player made a contribution to this match, with very, very few errors. They were perfect and did exactly what they needed to do. They stayed motivated and focused and didn’t lose their heads when the game got tough. Now, when I think of the champions who have moved on, I can honestly say that this group deserve to wear the red and black as champions, too. Yes, even eight minute-Traoré. All year long, they have been known as less than, even us fans have been fawning for the players we lost. But tonight, they showed us who they are. They are the players we have now, they are world beaters, and they are more than perhaps previously met the eye. They have what it takes to shut down the one and only Messi and all of his teammates for only the 3rd time in 25 Champions League matches. Our boys also won a Champions League match at home for the first time this season. And they made believers of even the biggest skeptics on a world stage. Is there anything they can’t do? I hope Inter are ready to find out on Sunday. Because miracles do happen.